Little tangible remains on earth to summon up the somber history of Dr. Harvey Burdell and Emma Hempstead Cunningham other than their final resting places at Brooklyn’s Green-Wood Cemetery. These unmarked plots and the gravesites of many other players in Butchery on Bond Street continue to transport me to a place in which I love to roam. My years of research turned up nary a single physical remnant of these people’s lives to enjoy first hand. The dignified tomb of “Elegant” Oakey Hall, the modest gravestone of Dimis Hubbard, and the earthly remains of Emma’s father, Christopher Hempstead, Sr. all astonished me when I finally found them. Poor Dimis: “sheltered” by her cousin Harvey after the young wife caught her husband William Vorce philandering in a whorehouse in lower Manhattan. After Harvey finished his incestuous commerce with Vorce’s twenty-something bride of but a few years, Dimis returned to Jefferson County, disgraced and alone. Thank heavens she was not called as a witness when her cousin was found stabbed to death. Neither Coroner Connery nor counsel for either side in the Emma’s murder trial saw the need to put the young woman on the stand, despite her central role in the mayhem that ensued at 31 Bond Street after Emma Cunningham moved in, first as a boarder of Mrs. Jones in the fall of 1855, then becoming landlady in May of 1856. Dimis ended up marrying another Jefferson County man, Hubert Barton, but she predeceased him in 1888, at the age of 55 in Watertown, NY. 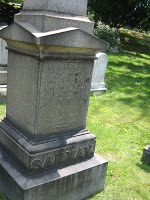 Barton passed on in 1902, and the two are buried side by side in Brookside Cemetery in Watertown. Dimis had no children by either husband. Sometimes you needn’t look too hard when digging up remains of the day. Such was the case when I arrived at Trinity Church’s uptown cemetery in Washington Heights, Manhattan, prepared to do some walking about in order to find Oakey Hall’s grave. Broadway bifurcates the majestic northern burial ground, and ornate tombstones and mausolea decorate lushly wooded slopes. Even by the time of Harvey Burdell’s death, Trinity’s downtown churchyard was long-filled, and the Episcopal Archdiocese opened a magnificent burial ground on a pastoral site far from the center of urban life. Oakey Hall certainly needed a quiet resting place. The bogus baby scandal brought the sweet taste of revenge to his lips, but Hall would ultimately be vanquished by Henry Lauren Clinton a second time. Though a Republican Party stalwart at the time of the Burdell goings-on, Hall soon switched horses and became a Tammany Hall regular. His allegiance to Boss Tweed was duly and fully repaid. Infamous as the ruler of New York after the Civil War, in his heyday, Tweed held no elective office at the height of his power, choosing, instead, to rule through three henchmen. At the end of the Tweed Ring, Controller Richard B. Connolly, City Chamberlain Peter B. Sweeny, and Mayor Abraham Oakey Hall controlled every aspect of City government. When the corruption scandal broke in 1870 and a committee of seventy citizens was appointed to investigate, who was named Special Prosecutor to go after Tweed and his troika? Oakey Hall stared out of the prisoners’ dock at a very familiar face, that of Henry Lauren Clinton. Three trials later, Hall remained a free man, his role in the grafting never proved beyond a reasonable doubt. He died on October 7, 1898, impoverished, and was buried in his first wife’s family mausoleum, according to his biographer, Croswell Brown. Trinity’s uptown cemetery has two main entrances, one on Amsterdam Avenue south of 157th Street, and the second on 155th Street, west of Broadway. I didn’t even need to inquire at the office when I made my way uptown to find Oakey Hall’s gravesite. Poverty is hardly the first thing that jumped to mind when I encountered Hall’s mausoleum immediately inside the latter of these two gates. Heaven knows who paid for the majestic tomb (which is, given his own surname thereon, perhaps not the site of Hall’s original interment), but he lies there in peace, having suffered over 25 years of disgrace after Tweed’s downfall. Emma Hempstead’s parents were devout Wesleyan Methodists, members of the Sands Street congregation and others as they moved around Brooklyn in the 1820s and 30s. Rope-maker Christopher Hempstead, Sr. made his final home at 94 Classon Avenue, a site now memorialized by the construction of a ramp to the Brooklyn-Queens Expressway smack on top of what once was a beautiful tree-shaded residential block of clapboard-sided and brick houses. In the late 1830s, the Wallabout neighborhood was a difficult carriage ride from the Sands Street church and its satellite chapels near the Navy Yard in which the Hempstead family had long prayed. Christopher Sr. spent the final days of his life practicing his religion in a small local congregation. 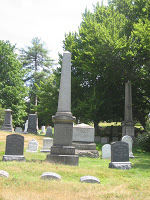 In 1828, the Wesleyan Methodists acquired a one-third interest in the multi-denominational Brooklyn civic burial ground established four years earlier. The site at Auburn Place and Portland Avenue is now covered with the early 20th century structures of Cumberland Hospital. Real estate development galloped through downtown Brooklyn in the mid- and late nineteenth century. Residential neighborhoods rapidly depopulated as property values rose and commercial structures replaced once-quiet blocks of homes. Depopulation also meant dwindling church memberships. Many congregations moved lock, stock and barrel to the neighborhoods where significant bunches of their parishioners resettled. 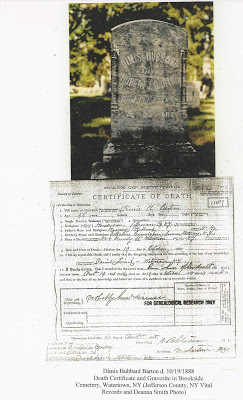 Notices frequently appeared in the Brooklyn Eagle and other papers advertising for loved ones to come and claim the remains of their family members from churchyard cemeteries, barring which the coffins would be unearthed and disposed of en masse. It was not uncommon to see carts filled with deteriorated wooden caskets, bones sticking out of the cracks, rumbling down Brooklyn streets, on their way to mass graves. Such indeed was the fate of Emma Hempstead Cunningham’s father’s remains. 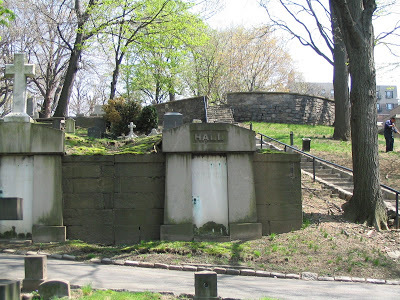 When the Brooklyn burial ground was excavated in the late 19th century, the unclaimed stones and remains from the Wesleyan Methodist section were transported to The Evergreens Cemetery in southwestern Brooklyn and deposited at the crest of one of its major escarpments. I bicycled out to Bushwick one summer afternoon and inquired about Christopher Hempstead Sr.’s grave. The Evergreens attracts far fewer history buffs than Green-Wood, and Superintendent Salamone was thrilled to have me visit, even on the spur of the moment. It was a gorgeous day when he escorted me to the hill-top in question. Few know of the excavation of the Brooklyn City burial ground, much less its relationship to The Evergreens. We quickly found the exact spot, but alas the only sign of the graves was one illegible tombstone fragment, peeking up from some very green grass. I solaced myself with the superintendent’s certainty about where we stood, and the 50-mile view out over the Rockaway Beach and the Atlantic Ocean. Christopher’s eldest daughter may well still turn in her grave, but her father’s eternal rest is assured. 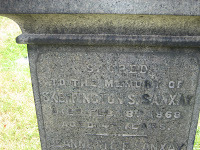 Skeffington Sanjay practiced law in New York in the mid-19th century. One of his clients was a dapper Bond Street resident named Harvey Burdell. Sanjay (whose name is frequently spelled Sanxay in contemporary documents), handled a number of not-so-civil matters for Burdell, including some of his dealings with his nemesis, Emma Cunningham. Though I’ve not tested my theory exhaustively, empirical evidence makes me a betting man: chances are 50/50 that if you were not Catholic or Jewish, had a few bucks in the mid-19th century, and were a resident of Manhattan or Brooklyn, then when you passed on, you were buried at Green-Wood Cemetery. A few weeks ago I was walking out of the Green-Wood grounds the long way after my day of archival work. It was warm and sunny, and I headed for the Fourth Avenue entrance down at the southwest tail end of the giant site. As I turned towards the mulberry trees beckoning to me from the maintenance shed sidewalks with their loads of ripe fruit, an obelisk caught my eye. Sure enough, there was Sanjay. They’re gathered here, these Burdell players, almost all of them. Heaven knows what happens after the clock strikes twelve.